Just yesterday PetSmart announced the purchase of online upstart Chewy.com for $3.35 billion. That’s a lot of kibble. In fact, the deal represents the largest e-commerce acquisition ever, eclipsing Walmart’s purchase of Jet.com. 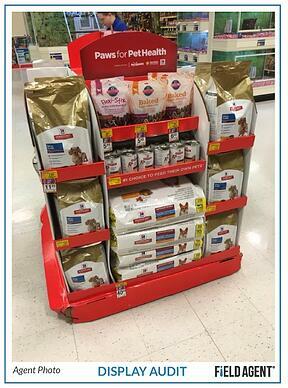 But what does the purchase really mean for PetSmart and the larger pet food industry? This weekend mobile solutions firm Field Agent surveyed 583 “digital” dog and cat owners about their online pet food purchases. The sample was comprised entirely of shoppers who purchase at least 50% of their pet food online. Field Agent located these respondents through a screener, and all pet owners were required to submit a photo of their in-home pet food supply. Based on the results, below we offer a five-question QuickFire Q&A about Chewy.com and its customers. As the videos, photos, and insights in this article demonstrate, Field Agent regularly serves brands, retailers, and agencies with answers to their questions about pet supply shoppers and in-store conditions. 1. How popular is Chewy.com as an online destination for pet food purchases? 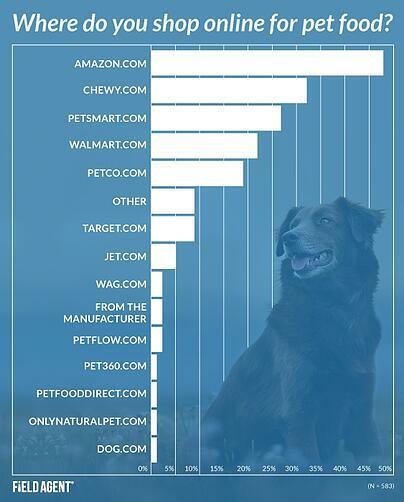 According to Field Agent's survey of over 500 "digital" pet owners (i.e., shoppers who purchase most of their dog/cat food online), as an online destination for pet food Chewy.com (32%) is second only to Amazon (48%). More popular among respondents than even PetSmart.com, Walmart.com, and PetCo.com. Now don’t miss this: With its purchase of Chewy.com, PetSmart may very well become the most popular online retailer for pet food. Forty-eight percent of digital pet owners said they purchase dog/cat food from Amazon.com, but a combined 59% buy their supplies from Chewy.com and/or PetSmart.com. Whoa. 2. What do customers buy from Chewy.com? Mainly dry, premium pet food. Eight-of-ten respondents (79%) said they buy the relatively higher-priced, meat-based, dry dog and cat foods (e.g., Blue Buffalo, Royal Canin) from Chewy.com*, followed by soft/chewy treats (40%), crunchy treats (40%), wet-premium food (27%), dry-value food (22%; e.g., Alpo, basic Pedigree), and wet-value food (17%). Findings on Chewy.com customers mostly mirror the larger sample of all digital pet owners (N = 583), in which 70% said they purchase dry, premium pet food online. See also: Which Retailers are Winning the Dog & Cat Fight? 3. Which do Chewy.com customers go in for: automatic reordering or single-purchase ordering? 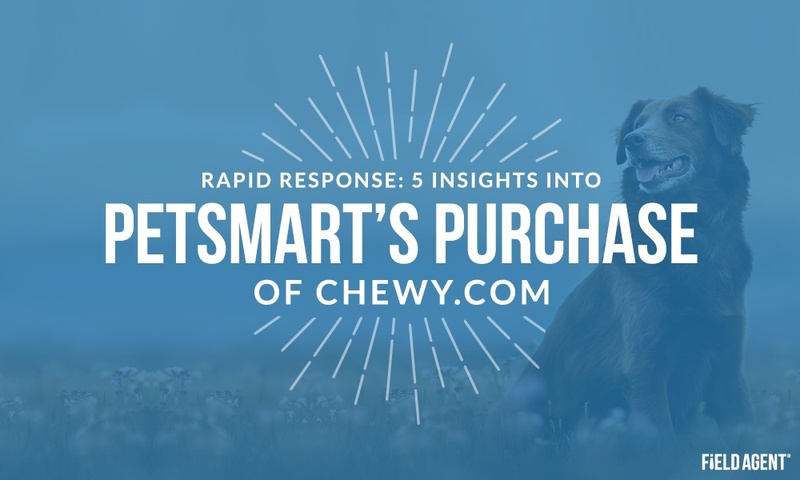 In our survey, only 38% of Chewy.com customers said they have a subscription with an online retailer, letting them automatically reorder pet food. The majority said they prefer single-order purchasing to auto-reordering. By 14 percentage points, Chewy.com customers were more likely than the overall sample of digital pet owners (24%) to have an automatic subscription. 4. Do these auto-subscribers still buy dog/cat food IN STORES? 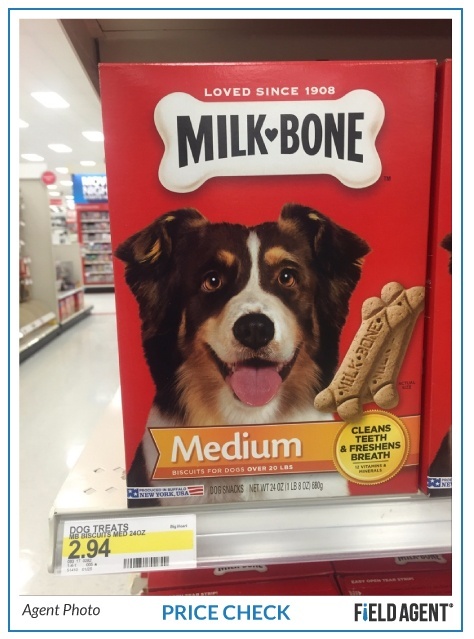 Consequently, PetSmart’s purchase of Chewy.com may have real omnichannel potential. If the company can figure out how to “synergize” its B&M operations with its online offerings, the Chewy.com acquisition may really payoff. 5. Will Chewy.com customers ever go back to buying dog/cat food primarily in stores? At this point, most Chewy.com customers strongly prefer buying for Fido and Mittens online. As important retail news breaks, the Field Agent Blog is there to help business professionals make sense of it all. Subscribe to our blog, ranked a top 10 market research blog by Feedspot, for even more “rapid response” features.